Romulea rosea var. 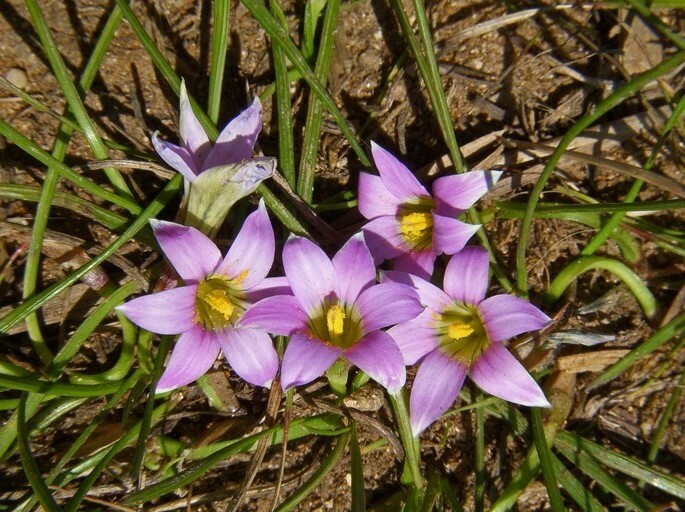 australis (rosy sandcrocus) is a perennial herb/ (family Iridaceae) with pink flowers and long narrow leaves (grasslike) found in the San Francisco Bay area, Sacramento Valley and north and central coast ranges of California. It is native to southern Africa. It favors grasslands, woodlands and dunes. It spreads via corms that build up in the soil locally and may also be propagated by seed. Means of dispersal include animals and machinery.